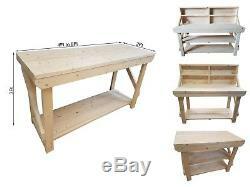 Wooden Work Bench Acorn-Premium - 4ft to 8ft. Available in Standard / Double Shelf / With back variations. Made of construction grade CLS C16 timber. All sizes can be modified on request. Strong, sturdy and beautifully finished. Hand made in the UK. Arbor Garden Solution hand manufacture high quality garden furniture for the domestic, commercial and public sectors. Our products are heavy duty in construction and are made by professionals for professionals. 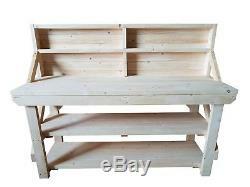 Our high quality work benches are made from C16 construction grade 89mm x 38mm CLS Scandinavian softwood. 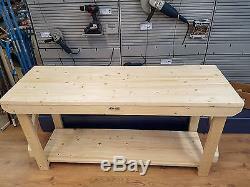 Our Benches are the perfect addition to your workshop, garage, shed or even a craft room. 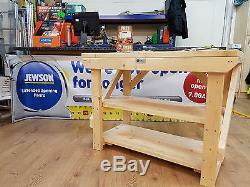 Due the sturdy construction of the bench it is easy to add permanent additions e.
Wooden Work Bench Acorn-Premium 4ft to 8ft Available Standard/With shelf/With Back Variations. Metric: Width 1200 to 2400mm x Height 900mm x Depth 630mm Imperial: Width 4' to 8 x Height 3' x Depth 2' Total Height With Back - 1450mm / 4.75. 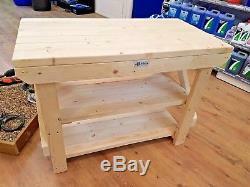 Different Heavy Duty Work Tables available! 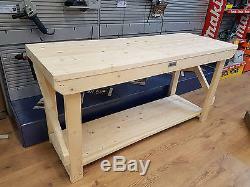 Bespoke workbench requests are welcome! We can manufacture workbenches as per customers design or amend dimensions of our current designs. 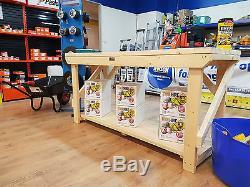 MDF Wooden Workbench With Lockable Cupboard. 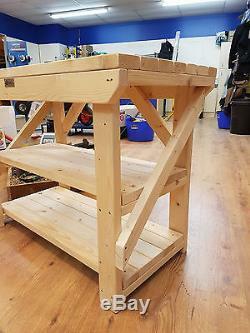 Wooden Work Bench ROTEM with Wheels. The item will be delivered flat pack. Easy assemble and only requires a screwdriver (preferably battery operated) to finish. AB10 - 16 / AB21 - 25 / AB30 - 35 / AB39 / AB99. KA1 - 26 / KA28 - 30. SA11 / SA14 - 20 / SA31 - 34 / SA41 - 47 / SA61 - 73. Due to logistical limitations WE DO NOT deliver to Scottish Highlands & Islands, Northern Ireland, Channel Islands or any offshore Islands. Please note - we are committed to minimise our environmental impact across our operations and use very limited or no packaging when delivering our goods. All our products are made from wood which is a raw material, therefore, there may be some splits and cracks that can appear in the wood from time to time which may come and go with changes in the weather. There is no need for any further treatment as the pressure treatment process can protect against rot for up to 15 years, however, like all wood, it will weather and season naturally over time. The products will turn an attractive silvery grey over the years. We would advise adding a furniture oil or linseed oil based product once a year just to replenish and moisturise the wood, which will also delay the weathering process. The timber can be painted or coloured using most softwood paints and stains if desired. 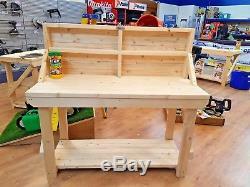 CLEARANCE HEAVY DUTY 4 FT TALL DOUBLE BAY LARGE WOODEN LOG STORE. 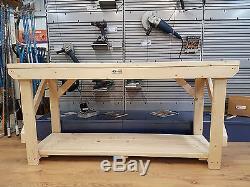 MDF Wooden Work Bench - 4Ft to 8Ft- Work Table - Hand Made - Strong Heavy Duty. Chestnut Eco Log Store - Outdoor Firewood Storage Shed Pressure Treated. 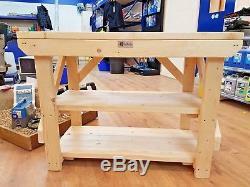 Wooden Work Bench Acorn-Premium - 4ft to 8ft - Work Table Strong Heavy Duty. The item "Wooden Workbench Acorn 4ft to 8ft Garage, Workshop, DIY Heavy Duty Work Table" is in sale since Friday, March 31, 2017. 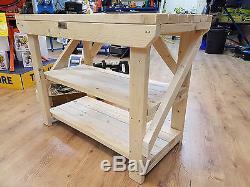 This item is in the category "Business, Office & Industrial\Manufacturing & Woodworking\Woodworking". The seller is "arborgardensolutions" and is located in PETERBOROUGH. This item can be shipped to United Kingdom.